These are our gorgeous gift soap pouches in attractive, Australian bush theme packaging, which makes them excellent gifts. With a small hole on the side, they have the added convenience of smelling the aromas wafting through, whilst being protected from dust. Individually labelled, these are available in a set of 5 different designs (1 soap bar in each) and make a practical and ready packaged, uniquely gift. 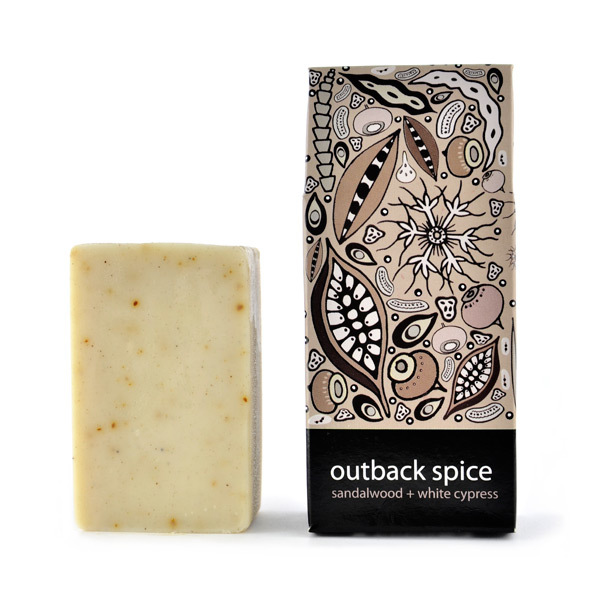 Outback Spice - Sandalwood + White Cypress. Natural soap is handmade the old fashion way, using all natural ingredients. Store bought soap is mostly synthetic, and is full of harsh detergents and chemicals. Most large-scale manufacturers of soap extract glycerin from soap and sell it as a by-product to other companies. In fact, most store bought soap you are using right now is a detergent bar, not soap. If you get out of the shower and your skin feels tight and itchy, there is a good chance you are using detergent on your skin. On the other hand, using organic, natural, handmade soap, is the perfect way to actually achieve that skin'to die for'. As it contains only natural ingredients, there is no chance of developing any allergic reactions or other skin problems. Keep in dry and cold place. Hot temperature will melting down the bar soap. Dry the soap off before putting it in the soap dish. Keep soap out of water, away from the direct shower stream to avoid "melting." Limit the amount of soap usage by busting out a washcloth. A shower sponge or mesh sponge will also do the trick. Unwrap empty soaps and place them in a drawer or between layers of linens. This helps "cure" the soap (dry it out), making for a harder, longer-lasting bar. As a mother of two, Pip Guyatt started experimenting with making homemade, natural soaps in order to reduce the skin irritations suffered by her eldest son. The results were amazing, and soon Pip began receiving orders from family and friends, and eventually from retail outlets. Dindi Naturals is now renowned for making natural soaps that contain NO toxic or synthetic chemicals; and that derive environmentally-friendly ingredients from areas of fair trade and sustainability. Pip's base is in the mountainous north-east region of Victoria, Australia, known as the Murrindindi Shire - hence the name Dindi. The location is as natural as her products, so when you use a cake of Pip's soap, you feel the freshness of the Murrindindi, and the overall vitality of beautiful Australia. Material： Outback Spice - Sandalwood + White Cypress.